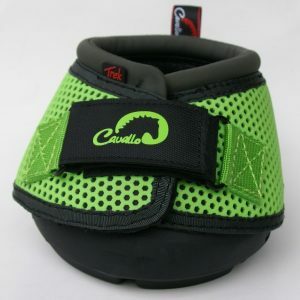 The CLB upper is heavy duty industrial grade 1680 Denier Nylon with a soft foam collar for your equine’s comfort with reflective logos for safety and a supple and flexible bulb. The boot goes on easily, conforms to individual hoofs and pasterns, and it stays on. Each boot can fit a left or right foot or be used on the rear hooves. “OMG. These CLB’s are wonderful. No hesitation. old woman excited but these boots are great. and NO rubbing – thank you Cavallo. Nougat Bar Loves His Cavallo Boots!